At K Group Inc. we are committed to respecting and protecting your privacy. of a K Group publication. We do not disclose, sell, trade, or rent your personal information to outside parties. We do maintain this information in a secure offline database to facilitate future communication and interaction with you. Our web builders have taken strong measures to protect the security of your personal information and to protect data from misuse, unauthorized access or disclosure. We use them to provide additional security and streamline your interaction with our site (for example, by eliminating the need to re-supply personal information when accessing an area that requires it). Most web browsers automatically accept cookies, but you can usually change a setting in your browser to give you the choice of accepting them or not. If you choose not to accept our cookies, you can still use most of the functions on our site, however you will be required to re-enter personal information each time you access an area that requires it. Like many companies using the Internet to interact with their clients and potential clients, we do use tracking software to generate reports on how people are using our site. This information is used to continuously improve the content, performance and usability of our site. We do not disclose, sell, trade, or rent any personally identifying information obtained in this way to outside parties. We may also use the personal information that you have voluntarily submitted to send you an e-mail or postal information which you have specifically requested. You may opt out of receiving further communications via e-mail or postal mail by contacting us via Contact Information at the bottom of every screen. Please note that kgroup.us contains links to other sites and those sites may not follow the same privacy policies as kgroup.us. The foregoing policies are in effect as of August 21, 2005. K Group Inc. reserves the right to change this policy statement at any time by posting the revised policy on this website. This statement and the policies outlined herein are not intended to and do not create any contractual or other legal rights in or on behalf of any party. Please contact us if you have any questions or comments about our privacy policies. © K Group Inc. K Group Inc. owns and operates this Website. 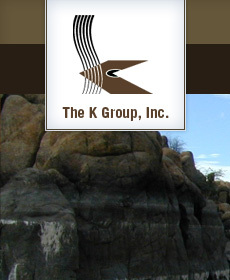 K Group Inc. and related words, domain names and logos are trademarks and the property of K Group Inc. The material contained on this Website, including all portions of the website, content, site design, text, graphics, and the selection and arrangement thereof are Copyright © K Group Inc. ALL RIGHTS RESERVED. No material from this website or any website owned, operated, licensed or controlled by K Group Inc., may be copied, reproduced, republished, posted, transmitted, or distributed in any way. The user may print, in hard copy, portions of this website for informational purposes only. The use of any such material for any other reason, on any other website, or the modification, distribution or republication of this material without prior written permission from K Group Inc. is strictly prohibited.